For unknown reasons, Cing’s final game was only released in Japan and Europe (in a multilingual version, no less). Like many other video game sequels, Last Window builds on what worked in Hotel Dusk while paring down aspects that were less effective – but in the process loses some of the pacing and focus that made its predecessor so effective. 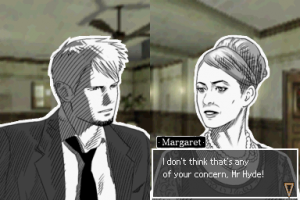 The game engine itself is largely unchanged from Hotel Dusk, with the first-person perspective, dialogue trees, and end-of-chapter quizzes working exactly as they did before. DS Rumble Pak support is even still included for whatever reason. There are a few improvements here and there, the most useful of which is an instant-dialogue review available at any time by pressing Select. 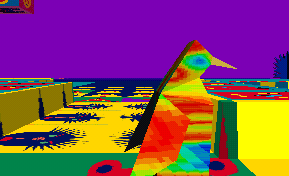 The graphics seem to have been improved slightly, with a little more detail in objects, and shifting the perspective in zoomed-in views is a little smoother. The textures of the first-person view feel a little cleaner as well, and there are some nice subtle lighting effects. 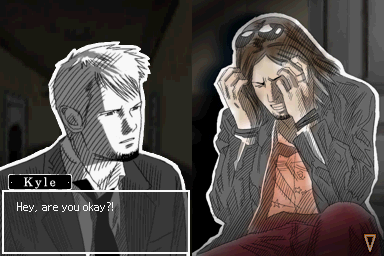 Near the end of the game is an all-too-brief section in which Kyle is obliged to wander around with a flashlight, impressively handled by the engine. Last Window also has proper pre-rendered FMV cutscenes as opposed to the cobbled-together animations of Hotel Dusk, but they are used to poor effect, primarily serving as brief and fairly meaningless inter-chapter transitions. 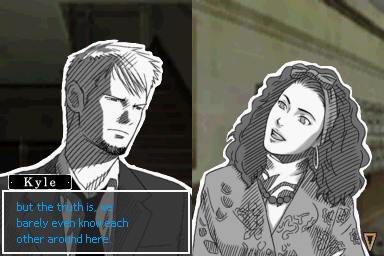 Without the charming “Take On Me” of aesthetic of Hotel Dusk, the opening cutscene – while stylish in its own right – just seems strangely out of place, considering the rest of the game is still spent chatting with the artful, sketchy portraits. 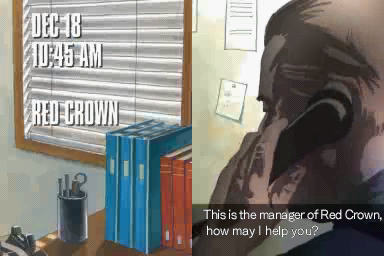 The story takes place almost exactly a year after the events of Hotel Dusk. It opens with a bang: Ed fires Kyle from his job at Red Crown, having grown weary of his attitude. Despondent, Kyle returns to home at Cape West Apartments, only to quickly learn that the building has been sold and eviction notices have been issued. But there’s another surprise in store in the form of an order sheet of the sort normally issued by Ed: “Item: Locate the Scarlet Star, which disappeared at Hotel Cape West 25 years ago.” Little does Kyle know that, as artfully pointed out by the opening cutscene, Cape West was the site of two murders, one 13 years ago and another 25 years ago, associated with some sort of attempted diamond theft. But who sent the order sheet? And why has the building been sold? 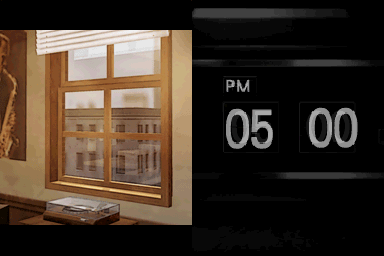 Whereas the story of Hotel Dusk took place over the course of an evening, the subsequent events at Cape West are drawn out over the course of a week; in terms of gameplay, it’s only slightly longer. The clock still advances only when the story demands it, often jumping to some arbitrary hour rather than increasing incrementally. Kyle occasionally narrates tales of leaving the building and wandering the city, but the action is confined to the interior of Cape West and to Kyle’s dealings with the departing tenants. While most of them are at least familiar to Kyle, he’s never bothered to get to know them particularly well until his current predicament. The elderly landlady, Mags purchased the building thirteen years ago, when it was known as Hotel Cape West, and renovated the rooms – except for the fourth floor, which remains untouched. She has good enough reasons for selling the building, but there’s a lot more than she’s letting on. A friendly musician who’s down on his luck and getting just a little bit desperate. A perky young woman, Betty is best described as pretty much the least interesting character in either of the two games. Whoops. Marie is troubled and possibly a bit paranoid, having attracted the wrong kind of attention. Making use of his position as the building’s maintenance man, Dylan seems to have some sort of pathological need to pry into the lives of its inhabitants. Or is there more to it than that? 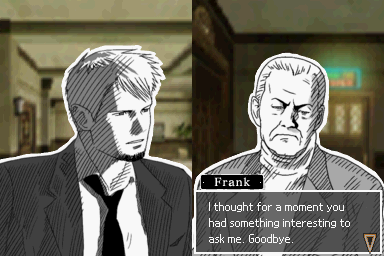 Frank initially seems to be a cantankerous old man, but he too has a lot more to him than initially appears. Charles is a French exchange student hoping to become a movie director. In that regard, he’s slightly more interesting than Betty, but not by much. Sidney is the longtime proprietor of Lucky’s Cafe on the ground floor of Cape West. He’s familiar with the tenants and knows a few things about the building where he’s been for so long. Kyle also eventually learns more about his absent wife. Sidney’s cheerful daughter, who works in Lucky’s Cafe. A shifty character hanging around the building for unclear reasons, Rex seems to know a little bit too much about Kyle. Though Kyle doesn’t spend too much time dealing with Rex directly, his presence is felt for much the story. Introduced as a salesman, Will is never even mentioned until halfway through the story, at which point he abruptly shows up, turns out to have everything to do with the plot, and then disappears just as quickly. Whoops again. 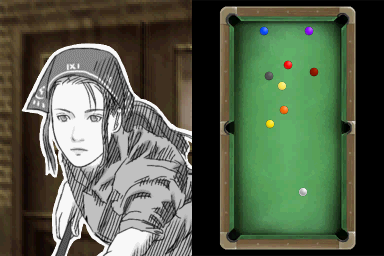 Mila from Hotel Dusk does turn up in a brief cameo, but her activities in the meantime are probably the least plausible thing in either of the two games, and ultimately dealing with her is an inconsequential waste of time. 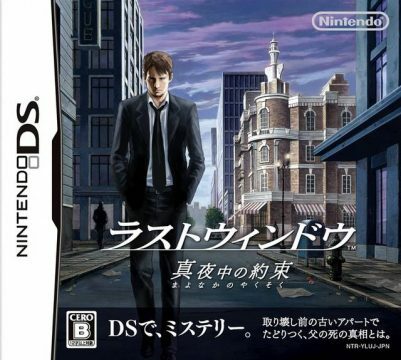 In fact, the events of Hotel Dusk are only touched upon very briefly over the course of Last Window and you can easily play through it with no knowledge of the first game; nor is Hotel Dusk particularly spoiled by Last Window. Last Window is still a very serious game, and there’s even a teensy bit of love and betrayal sprinkled in this time around, along with a politician and shenanigans in the Los Angeles Police Department. 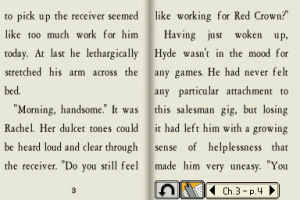 Unfortunately, as you may surmise from the character descriptions, it’s just not as compelling as Hotel Dusk. That game may have been a little bit cliched with each member of its cast conveniently having his or her own little secret, dispensed literally like clockwork at the end of each chapter. But while the cast members of Last Window are more realistic in that sense, the story suffers for it and having to deal with each of them gets to be a bit of a chore. The dialogue is still well-written and everyone still behaves in a consistent, believable fashion; it’s just that few of them are particularly interesting. 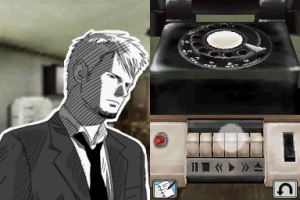 Nor does it end with them: instead of a driven man almost bizarrely tortured with the need to resolve the events of his past, the Kyle Hyde of Last Window just comes across as depressed and moody, chatting with his mom on the phone, and answering the door when people knock. Without the tension of the evening ticking away, you may start to wonder just how much of December 1980 you’re going to be obliged to sit through as you slowly wait for Kyle to figure out things you probably guessed when you watched the opening cutscene. Like before, Last Window is also still a very linear game, though the plot does contain a small number of rather well-crafted red herrings. 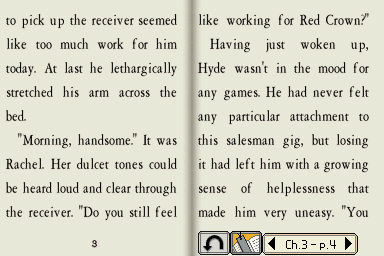 A particularly nice plot line appears halfway through the game, when Ed abruptly challenges Kyle to sell two items of his old Red Crown inventory to his neighbours. 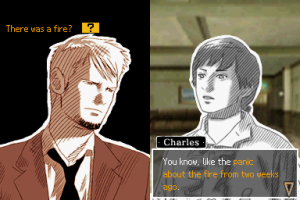 The ensuing puzzle has you investigating what various different characters need, and you’re even allowed to fail outright while you refine your approach. It’s too bad the whole thing could be entirely excised for all the impact it has on Kyle’s quest for the Scarlet Star. There’s still a vending machine in the lobby, but this time your only obligation is to try to feed it a quarter for each of the first few chapters in order to win your prize: a simple Game & Watch style minigame. Even if you forget, you win by default if you try at the last minute. Cing’s attention to detail still remains as weirdly persnickety as before, though it does show a few signs of slipping towards the end of the game. 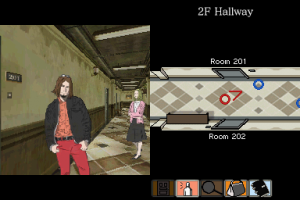 Unlike the rooms of Hotel Dusk, each location in Last Window contains an assortment of touches that really give you a feel for the person who lives there, however bland he or she may actually be. Kyle will still expound on every single cupboard and toilet paper roll in the game if you are so inclined. 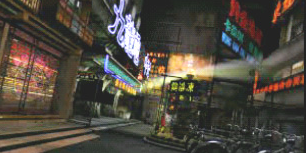 The gameplay is much the same as it was in Hotel Dusk. Inventory management isn’t quite as clean: while there’s no more messing around with Kyle’s briefcase, you’ll end up carrying around a bunch of items for most of the game for no good reason, including a screwdriver that seems like it should be useful in any number of places. 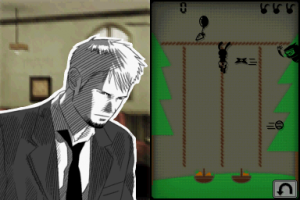 However, numerous puzzles are designed with Kyle confined to a room which he will refuse to leave until he’s accomplished what he needs to do, usually leaving behind whatever items he’s picked up afterwards and not returning again. Inventory items also now come with verbs like “combine” and “compare”, but they need to be used so rarely that it’s a bit strange that they are included at all. Nonetheless, every occasion when they are required still makes logical sense and you will never find yourself compelled to try combining every item with every other item in a desperate attempt to figure out what the designers were thinking – even though there’s nothing stopping you from doing so. Opportunities for messing up and being served with a Game Over screen still abound, some of them appearing with very little warning, though things are a little less touchy than they were in Hotel Dusk. Unlike Dunning, Mags isn’t waiting to spring from the shadows to kick Kyle out. Some mistakes will at least reward you with a reasonably entertaining dialogue snippet from whoever it is Kyle manages to annoy to his or her breaking point, but most of them just end with Kyle apparently so despondent over committing some social faux-pas that he inexplicably cannot bear to go on. 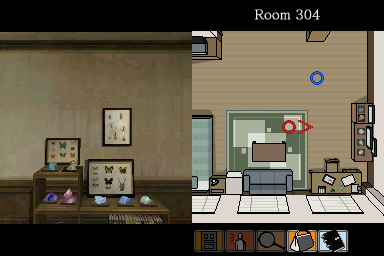 Like Hotel Dusk, there are a good many instances in which items have to be manipulated on the touch screen, but while Hotel Dusk was pretty forgiving with these (you could chop up a coat hanger early in the game over and over again until you got it right, for instance), there are a couple of times in Last Window where there’s no going back if you happen to break whatever it was you were messing with. It’s probably for the best that a little tension remains, as most of the puzzles aren’t really intrinsically difficult. Yet once again, even though it’s more realistic that your failure will not inevitably end with a rude confrontation with the likes of Dunning, the atmosphere suffers somewhat for not having any one thing in particular associated with a Game Over. At least the soundtrack is generally just as good as before, with only a few pieces recycled from Hotel Dusk. It might be described as more somber in tone, perhaps fitting for Kyle’s disposition. Some of the best pieces are tragically underutilized and only play for very brief periods of the game; some only turn up in-game when the radio and television in Kyle’s room are used. 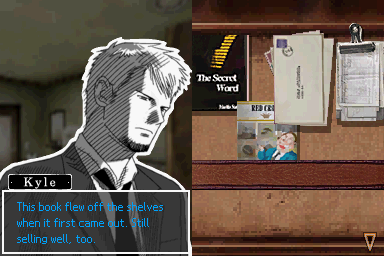 There’s another jukebox which can be used to listen to all the tracks, but being located in Lucky’s Cafe, it’s available for the entirety of the game; you can even use it when reading the Last Window novel. 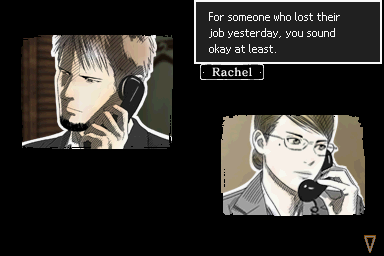 Last Window certainly won’t win over anyone who wasn’t a fan of Hotel Dusk. 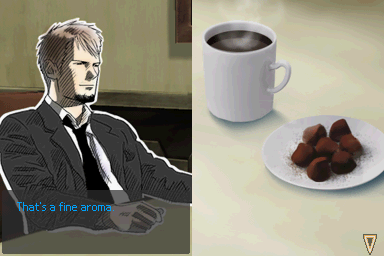 But for those who can’t get enough of Hotel Dusk, it’s all they’re going to get, however unsatisfying it may be. Cing filed for bankruptcy shortly after the game was released, which is perhaps an understandable fate for a studio with such a slavish devotion to tiny details. 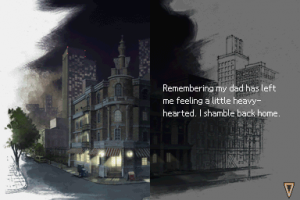 But for all its artistic merit and carefully-constructed puzzles, a game like Last Window doesn’t amount to much without its story and characters, and this time around they’re not quite up to par. Hotel Dusk Nintendo of America’s official site. 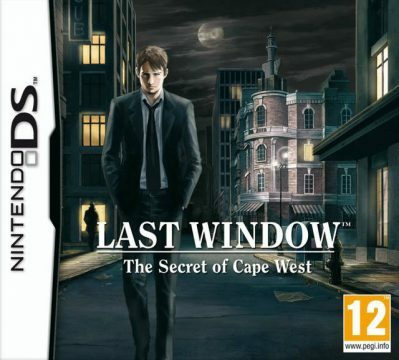 Last Window: The Secret of Cape West Nintendo of Europe’s official site. Last Window (Behind the Scenes: Animation) An official, detailed, spoiler-free look at the exhausting animation process.